No more hours spent hunting down a taxi from Impact Arena. 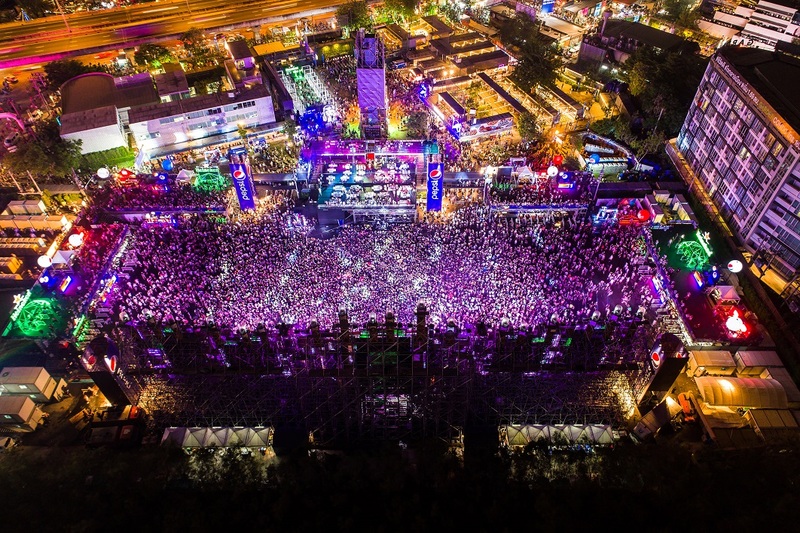 Show DC, the lifestyle and entertainment mega complex on Rama 9, has launched its B120 million large-scale arena, which they claim is Bangkok’s biggest outdoor event venue to date. Dubbed the Show DC Arena, the outdoor entertainment space right next to Show DC boasts a total area of 31,790 sq meters, is capable of catering up to 60,000 people, and also includes 1,000 car parking spaces. The new development, according to Goh Soo Sing, Chief Executive Officer of Show DC, comes from a huge demand for a large outdoor entertainment space in the center of Bangkok. There will be free shuttle services to and from MRT Petchaburi station, which should help make concerts and other entertainment events more accessible and appealing to both attendees and organizers. Show DC Arena has already been chosen as the venue for several high-profile events including the recent Chang Music Connection Musictropolis headlined by big rock bands like Bodyslam, Potato and Slot Machine, and the two-day MAYA Music Festival 2018 on Dec 8-9, which will bring together a killer lineup of global DJs, K-Pop and J-Pop superstars. The new outdoor arena can be used in combination with the 25,000-capacity Oasis Arena and the 5,000-capacity Show DC Garden to create an even larger-scale, 90,000-capacity outdoor space. This opening by Show DC is soon to be joined by The Mall Group’s joint venture with AEG, the owner of LA’s Staples Center and London’s O2 Arena, to build two-world class arenas in the center of Bangkok— Em Live (seating capacity of over 6,000 people) and Bangkok Arena (capacity of up to 16,000 seats), scheduled to be open in 2022 and 2023 respectively.